The Google Map shows known Armenian communities in the Central Asian Republic of Turkmenistan. This corrupt and repressive state was ruled by the vainglorious dictator Saparmurat Niyazov from the break-up of the Soviet Union until his death in 2005 and since then by another narcissistic autocrat, Gurbanguly Berdimuhamedow. There are perhaps 30 to 40,000 Armenians in the country, living mostly in the major cities indicated on the map. Armenians arrived in Turkmenistan during Imperial Russian times, others during the Soviet era. More recently, more arrived following the dissolution of the Soviet Union and the conflict between Armenia and Azerbaijan. Minorities have limited rights in Turkmenistan and, as might be expected, many Armenians with the means to do so have emigrated to Armenia, Russia or USA in recent years . There is no registered Armenian place of worship in Turkmenistan. The state recognises only Islam and the Russian Orthodox Church (the churches of which are used by some Armenians). Of the five pre-Soviet-era Armenian churches (one per city shown on the map, except Balkanabat), the last standing was the one in Türkmenbaşy (Turkmenbashi – Russian Krasnovodsk), which was demolished in 2005. The former Armenian Apostolic church here was founded in 1904 but seized by the militantly atheist Soviet authorities in the 1920s and used as a warehouse. According to accounts on the internet, the church stood, decommissioned, at the junction of Pushkin and Lermontov streets. Street names in Türkmenbaşy have, for the most part, been renamed, although the street name Puşkin Köçesi survives in the old town (which was primarily Russian). However, Soviet-era Russian language maps do not show Ulitsa Pushkina and Ulitsa Lermontova as intersecting. Ulitsa Pushkina street was a short road joining Ulitsa Gogolya and Ulitsa Budennogo, both of which ran down to the square Ploshchad Privokzalnaya and the railway station by the waterfront. Ulitsa Lermontova, on the other hand, was further north, beyond the Russian cemetery (in which Armenians were presumably buried, it being the only Christian burial ground in the city) and running off 1 Maya (now Azadi Köçesi). Perhaps, therefore, Gogol rather than Lermontov was meant. Accordingly, the pin on the Google Map has been placed where the former Ulitsa Gogolya (now called Adalat Köçesi) joins Ulitsa Pushkina. In any event, the church survived until 2005, when it was demolished by the Turkmen authorities, despite repeated requests for it to be returned to the Armenian community. The Krasnovodsk street plan below shows the old Russian town, with Russian street names, during Soviet times. Ulitsa Pushkina can be seen (as “ул. Пушкина”) towards the left-hand side of the map. The Google Map shows places of Armenian settlement in the Krasnodar krai, or region, of Russia, also known historically as the Kuban. The history of Armenian settlement in this region of southern Russia is both old and complex, with multiple layers of immigration. These date from the Middle Ages (with the so-called Cherkesogai or Circassian Armenians), through to C19th Hemşin/Hemshin migrants from Anatolia (both Christian and Muslim converts), to 1915 Genocide survivors and late C20th refugees from Azerbaijan, Chechnya and Georgia and even from Central Asia. For over 500 hundred years, the Krasnodar or Kuban region has been a safe haven for Armenians. Over 60 cities, towns and villages with a significant Armenian presence are plotted on the map. However, there are many small towns and villages with a modest or minority Armenian population not marked on this map; it does not purport to be fully comprehensive and complete. Churches are shown (indicated by a cross) only when known to exist and positively identified. This does not mean to say that other settlements do not have places of worship. As mentioned above, a proportion of the Hemshin Armenians are adherents of Islam rather than Christians. This Google Map shows the Armenian Quarter of the old walled city of Jerusalem and other sites of Armenian settlement and interest across Israel and Palestine. The sites within and around Jerusalem, including Gethsemane and Mount of Olives, are of course well known, as is the Armenian Apostolic Church’s role in the custodianship of such holy sites as the Church of the Nativity in Bethlehem. Less well known are the small Armenian communities, most dating back to the aftermath of the 1915 Armenian Genocide, when Armenians were marched and fled south to Palestine as well as Syria, leading to the establishment of settlements in, for example, Jordan and Lebanon. The Israeli State tends to regard and treat the Armenian minority as if they were Palestinian. This is witnessed by the unrelenting encroachment upon the Armenian Quarter in Jerusalem but also by the compulsory purchase of Armenian-owned land in Bethlehem, for instance (the Baron Der Orchard there was sacrificed to the Security Wall). A little known Genocide survivor Armenian settlement was that at Sheik Brak, just inland near the town of Atlit, south of Haifa. This was effectively a refugee village without facilities which was never permitted to develop and eventually was abandoned. Today it is returning to nature, and there are a few remains of buildings and mid-C20th headstones amid the scrub and trees. The Google Map plots the main Armenian communities in Egypt. The two previous blog posts have looked at the cities of Alexandria and Cairo, giving extracts of Armenian names from a French-language directory of 1930. For completeness, a list of Armenian businesses in Mansoura, Port Said, Suez and Zagazig – the other cities of Egypt included in the 1930 trade directory – is given below. 1. Matossian. Separate businesses were set up by brothers Hovhannes in Alexandria in 1882 and Garabed in Cairo in 1886. They went into partnership in 1896 and were incorporated in 1899. Later, factories were opened in Giza and Zagazig. Subsequently, the controlling brothers Jacques, Joseph and Victor Matossian merged the company with British American Tobacco in 1927 but continued to operate as before. 3,000 employees circa 1930. 2. Melkonian. This company started in retail but moved into wholesale and manufacturing. The Melkonian brothers’ earliest factories were in Zagazig (circa 1883/84) and Faiyum (1888); later, factories opened in Alexandria, Aswan and Cairo. Producer of the Maden brand. 3. Gamsaragan. This was another family firm set up by brothers, which continued to operate under its own name (as Yervant Gamsaragan & Co) despite acquisition by British American Tobacco. Producer of the Abu-Najma and Delta brands. 1,300 employees circa 1930. 4. Ipekian. The founder Kevork Ipekian’s business was acquired by Maspero Brothers in 1924 but continued to operate under its own name. This blog on Armenians in Cairo is the second of two on the subject of the Armenians in Egypt, the previous one focusing on Alexandria. The same Google Map refers – it shows the main religious and cultural sites for the Armenian community in Egypt today, in the port city of Alexandria and the capital Cairo. All the sites on the map are current today. Below is a list of prominent Armenian professionals, merchants, manufacturers and traders extracted taken from a French-language trade directory of 1930. Names are shown alphabetically using the English alphabet, although most of the names show evidence of transliteration from Armenian using French orthographic standards. The list is likely to be incomplete, in the sense that some Armenians in the directory may have been missed, for instance if their names had been Anglicised or Gallicised, or abbreviated (losing a distinctive Armenian surname suffix). It is also quite conceivable that the list includes some non-Armenians – for instance, a few Coptic Christians, Maronites, Syriacs or even French who I have not been able to distinguish from Armenians. This Google Map shows the main religious and cultural sites for the Armenian community in Egypt today, focused on the once cosmopolitan port of Alexandria and the capital Cairo. The sites on the map are believed to be extant today and also for much of the C20th. The marked sites include Armenian Catholic and Armenian Apostolic Church buildings and cemetries, plus a few cultural associations such as sports clubs and schools. This particular post is the first of two and focuses upon Alexandria. Below is a list of prominent Armenians taken from a French-language 1930 trade directory. The Armenian population of Alex may have been as high as 30,000 at that date so, of course, any extract from a commercial directory invariably captures only a very small percentage of the overall population. However, it gives some idea of the families in town and of how their surnames were transliterated using French orthographic standards (which, naturally, differ from the English – for example, favouring ch- where English would use sh-). 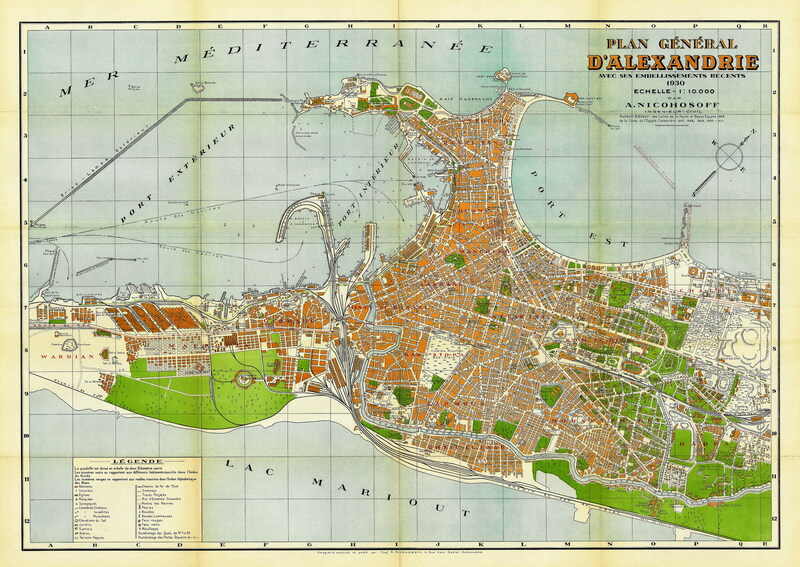 It is not possible to map the given addresses on the Google Map, as the street plan of Alexandria has changed – by which is meant not so much that street names have changed (although of course many if not most have) but that the layout of the city has altered in places so that a street extant in 1930 may no longer have a counterpart today. However, most of the streets given in the extract of Armenians of Alexandria can be found in the Attarine, Labbane and Manchieh districts of the city on old maps. A very nice map can be found online (at the time of writing), on which a researcher should be able to find most of the streets listed in the extract. The above screenshot shows the principal Armenian neighbourhoods in Alexandria in 1930. The list below shows those Armenians in the town of Kayseri (Kesaria in Armenian) named in a small selection of French-language Ottoman trade directories – those for 1909, 1912 and 1913. The original volumes list individual professionals and tradesmen collated by occupation for ease of use by readers at the time. However, the list below is arranged alphabetically by surname, using the Latin alphabet, for ease of use by genealogists. Generally, the names are spelt in accordance with French orthographic standards in their transliteration from the original Armenian. Some surnames were spelt differently in different years (or differently by different members of a family, or by unrelated individuals sharing the same surname), and these differences are captured in the list. Kayseri (Kesaria or Gesaria) and other Armenian settlements in its vicinty are shown on this Google Map. “VAN (chief town of the vilayet). An old town, founded by Semiramis according to local tradition. The city is built near the edge of Lake Van, at approximately 5,200 feet above sea level. At the foot of the large rock that forms the citadel, remains of ancient buildings and cuneiform inscriptions have been found. 30,000 inhabitants, of whom 20,000 are Armenian. The suburb called Aykesdan (“the vines” or “the vinyards”) is very pleasant. The port is in commercial communication with secondary ports on the lake such as Nareg [Narek – modern Yemişlik], Ardjich [Arjesh – modern Erciş] and Tadouan [Datvan – modern Tatvan]. The lake is 80 miles long by 35 miles wide, if one does not count the gulf which extends inland to the NE and which measures 700 sq km, which makes the total extent of the lake about 3,500 sq km. In the months of May and June, the darekh fish [Alburnus tarichiis – the only fish native to Lake Van] is caught in great quantities, and both exported to Persia and preserved for the winter. Products: wheat, barley, vegetables, fruits, wines, oils, coal (untapped until today), zirnik [sodium sulfide], darekh fish, wool, tiftik [mohair], goat and sheep skins, and some furs. Salts [minerals?] are rich enough in the surroundings of Van. In Djoulamerik [Julamerik – modern Hakkâri], there is a mine with abundant reserves of zirnik but which is long abandoned. Industries: cotton fabrics of various kinds, carpets, tanneries, belts. Imports: European and Persian manufactures, colonial goods, cotton, worked skins. Exports: cattle, sheep, galls [used for ink and dye], skins, wool. The city is shown on this Google Map, together with various sites of Armenian interest , including those mentioned in the translation above. The Armenian residents mentioned in the directories consulted – those for 1881, 1883, 1885, 1889, 1891, 1893, 1894, 1896 – are as follows. The image below shows Van on a British Intelligence Division, War Office map of 1901, based on triangulation and reconnaissance carried out between 1880 and 1900 by various army officers and consular staff.